Brought to you by the Liberty Mutual Insurance Responsible Sports program powered by Positive Coaching Alliance. This month, hundreds of thousands of coaches and parents will be meeting for registration and initial team meetings all across the country. Whether it’s a first meeting or a re-acquaintance, these interactions between coaches and parents are a vital tool in building and fostering a positive and rewarding sports environment for our children. As you head to these meetings, whether you’re the coach or the parent, consider taking a Responsible Sports approach to help build a strong foundation for a winning season. At Liberty Mutual Insurance, we want to champion a Responsible Sports environment for our kids playing sports. We’ve partner with experts from across youth sports - like Positive Coaching Alliance and USA Hockey - to provide valuable tools, tips and advice to parents and coaches alike. And they universally agree: having positive parents involved with positive coaches creates positive outcomes both on and off the ice. Recognize the Coach’s Commitment: Coaches log many hours of preparation beyond the time spent at practices and games. And you’d better believe they’re not in it for the money (in many cases, coaches are working without any pay). Try to remember this whenever anything goes awry during the season. Make Early, Positive Contact: As soon as you learn who your child’s coach is going to be, introduce yourself, let him or her know you want to help your child enjoy the best possible experience, and offer to assist the coach in any way you’re qualified. Meeting the coach early and establishing a positive relationship will make conversation easier if a problem arises during the season. Fill the Coach’s Emotional Tank: When coaches are doing something you like, let them know about it. Coaching is a stressful job, and many coaches only hear from parents when they decide to voice a complaint. A coach with a full emotional tank will always do a better job. Don’t Instruct During a Game or Practice: Your child is trying to concentrate amid the chaotic, fast-moving action of a game, as well as do what the coach asks of him or her. A parent yelling out instructions hardly ever helps. More often than not, it confuses the child, adds pressure and goes against the coaches’ instruction, which undermines the player-coach relationship, the player-parent relationship and the parent-coach relationship. Observe a “Cooling Off” Period: Wait to talk to the coach about something you are upset about for at least 24 hours. Emotions can get so hot, that it’s often better and more productive to wait a day before contacting the coach. This also gives you time to consider exactly what to say to the coach, and how to say it. The relationship between coaches, parents and athletes are like any other relationship: they have their ups and downs. And there are situations that you or youth athlete need to address with the coach. How you address the issue is just as important as resolving the issue itself. Practice a Responsible Sports approach even as you address these issues. Empowering Your Child To Speak. There are several advantages to having your children, rather than you, speak directly to the coach. Many coaches are more open to suggestions from players than from parents. The biggest plus here is that this can be an empowering experience for children, even if they don’t get the result they seek. Summoning the courage to talk to the coach can be a great life lesson. Your children may gain important experiences about dealing with people above them in the power structure, at school or in future jobs, by discussing their issue with the coach on their own. When You, The Parent, Need To Intervene. We hope that you don’t find yourself in a situation where you, as a Responsible Sport Parent, need to intervene. But youth hockey has no place for a coach who verbally or physically intimidates his or her athletes. You would never allow a teacher to bully or humiliate a student, and you can’t allow it from a coach. How To Approach The Coach. If you’re angry about the situation, it’s best to gain control of yourself and make sure you know exactly what you want and need to say. Use a ‘cooling off’ period to collect your thoughts. Pick a time and place where only the coach can hear you – not during a game or practice, and not where you might be overheard, which could make the coach more defensive. You may need to write and even rehearse what you want to say until it sounds just the way you want it too. Be prepared to support your assertions with specific examples. Then listen carefully to what the coach says in return. If the results are unsatisfactory, you may need to go higher up in the organization, and you should be open with the coach that this is your planned next step. Again, be clear about what you want to say when you meet the athletic director, principal, coaching director or league president. Even though intervening feels uncomfortable, remember that you are not just standing up for your child, but also for all of the other children that play on the team, or who might play for this coach in future seasons. Given certain situations, it’s simply the right – and mature, adult – thing to do. Good luck this season from your friends at Liberty Mutual Insurance and Responsible Sports! 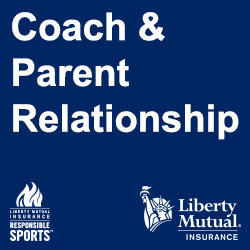 In an effort to benefit millions of youth athletes, parents and coaches, this article is among a series created exclusively for partners in the Liberty Mutual Insurance Responsible Sports Program powered by Positive Coaching Alliance. ©2013 Liberty Mutual Insurance and Positive Coaching Alliance. All rights reserved. This material may not be distributed without express written permission. Any reproduction in whole or part by and individuals or organizations will be held liable for copyright infringement to the full extent of the law. Cole, Head Coach of the USA Hockey NTDP, discusses how to turn diving and dirty play into teaching moments. What quality do you value most in a sports leader and role model for your child? Play Positive Poll: Hazing or just team bonding? Brought to you by Liberty Mutual Insurance’s Play Positive® initiative.